Joomla is a great application that allows you to control a lot of aspects of your site without any programming knowledge on your part. Installing it by yourself can be somewhat challenging but our Fantastico script makes it very easy. You can do it within a few clicks from the hosting control panel. We offer reliable hosting for Joomla. 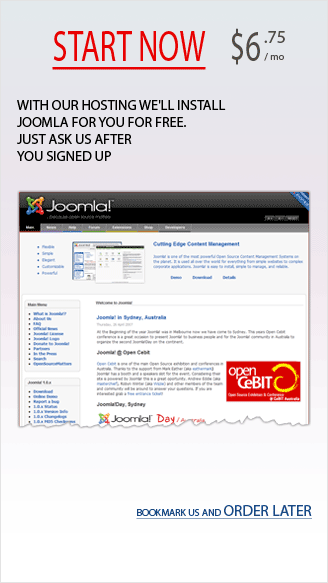 We can preinstall Joomla for you when you order your hosting from us, just request it. * The initial space we allocate is 4GB. Please, let us know when you need it increased. ** The initial bandwidth we allocate is 2GB. Please, let us know when you need it increased. *** We do not recommend having more that 3 domains per account for performance reasons.